The Centre of International Policy Studies (CIPS) is pleased to host a talk entitled: "Pax Indica: India in the World of the 21st Century" with Dr Shashi Tharoor, MP, Lok Sabha (Thiruvananthapuram, Kerala), Chairman, Parliamentary Standing Committee on External Affairs formerly, Senior Adviser to Secretary-General of the United Nations, Kofi Annan. This event is free to attend, please book a place using the Sign Up button above. The lecture will be followed by a reception in the Convocation Suite for all guests. Dr. Shashi Tharoor is the bestselling author of fifteen previous books, both fiction and non-fiction, including, the most recently released 'India Shastra: Reflections on the Nation in our Time' besides being a noted critic and columnist, a former Under Secretary-General of the United Nations and a former Minister of State for Human Resource Development and Minister of State for External Affairs in the Government of India. He served 29 years at the United Nations, culminating as Under-Secretary General under Kofi Annan's leadership of the organization. As India's official candidate to succeed Annan as UN Secretary-General, he emerged a strong second (to Ban Ki-Moon) out of seven contenders. On returning to India he contested the 2009 elections on behalf of the Indian National Congress, and was elected to Parliament from Thiruvananthapuram. Re-elected in 2014, he chairs Parliament's External Affairs Committee. 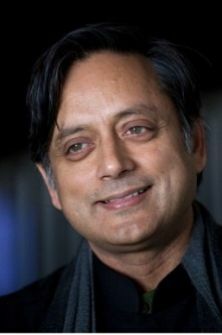 Dr. Shashi Tharoor's books include the path-breaking satire The Great Indian Novel (1989), the classic India: From Midnight to the Millennium (1997) and most recently, the visionary Pax Indica: India and the World of the 21st Century (2012). He has won numerous literary awards, including a Commonwealth Writers' Prize, was honoured as "New Age Politician of the Year" in 2010, and pioneered among Indian politicians the use of Twitter, where he has over two and a half million followers as of 2014. Dr. Tharoor earned his Ph.D. at the Fletcher School of Law and Diplomacy at the age of 22, and was named by the World Economic Forum in Davos in 1998 as a "Global Leader of Tomorrow." He was awarded the Pravasi Bharatiya Samman, India's highest honour for overseas Indians.